JULY 4 - AUGUST 14, 1967 — When I first arrived at the First Platoon of “A” Company, 1/8 Cav at the end of May 1967, I was assigned as a rifleman in Sam Witcher’s squad. While returning from a mission on July 4 of escorting tanks from the vicinity of LZ Geronimo to a point near Highway 1, we had one soldier, PFC Davis, lose a foot when he stepped on a land mine and Sergeant Witcher was killed when he stepped on and set off a booby trapped 105mm artillery round. I was in close proximity to Witcher when he set off the mine and I was hit in the chest and leg with shrapnel. The wounds were not life threatening so I was treated by our field medic instead of being medevaced to LZ English. I can’t remember the name of the medic, but he was temporarily assigned to the platoon shortly after Doc Schouwburg was killed on June 24 and before Doc Ferguson joined the platoon in mid to late July. Initially, the field medic removed the pieces of shrapnel that were visible and applied some ointment to help the wounds to heal, and to prevent infection. He then wrapped bandages around the larger wounds in my right leg and taped some gauze on a couple of the wounds on my chest. Our platoon was undermanned because we had two members killed and two others wounded in the July 2 firefight, and we lost two more members on July 4. As a result, I could not be medevaced to LZ English where I could receive proper treatment from a doctor, and to stay there until the wounds were healing properly. The platoon continued on our daily search and destroy, as well as our cordon and search missions. We also had to send out an ambush patrol and an OP every night. I received minor shrapnel wounds again about ten days or two weeks later, which were also treated by our field medic. However, while performing my duties during our daily missions, the bandages kept falling off my wounds and I had to see the medic frequently so he could treat and put new bandages on the wounds. The more times this happened, the more irritated he got at me. He was tired of being bothered with such mundane activities as treating and dressing minor wounds that weren’t healing. And, he was tired of my complaints regarding the pain I was having in my leg. The pain was so severe that I had to tear off part of my pant leg around the wounds because the pain of having the cloth of the uniform touch my leg was almost unbearable. As a result of the attitude the field medic had towards me, I just stopped going to him because I didn’t want to have to listen to his sarcastic and uncaring remarks anymore. Our platoon was working out of LZ Two Bits starting on July 26. We would go out on patrols during the day, send out two OPs each evening, and the remainder of the platoon would pull perimeter guard duty. We were picked up before dawn on July 30 and air assaulted to a village we had to surround before the South Vietnamese Police arrived so they could search the village. We were put down and had to set up in a flooded rice patty, so I got wet and smelled like water buffalo manure. Also, the excrement soaked into the wound on my leg and caused even more pain. After the National Police arrived and completed their search of the village, our platoon was air lifted and transported back to LZ Two Bits. After we ate our lunch, I went to take a shower because I just couldn’t stand to smell myself anymore. Sergeant Prock, our platoon sergeant, was already showering when I arrived. After he finished showering, sergeant Prock noticed my leg wound and told me it looked really bad and for me to go to see the doctor immediately after I finished with my shower. I took Prock’s advice, or order, and went to see the doctor and asked him to examine the wound on my right leg. He did a preliminary exam and decided that he could not treat the wound with the facilities available at LZ Two Bits. I was then put on a chopper and medevaced to the 15th Medical field hospital at LZ English and another doctor examined my leg. The doctor gave me a local anesthesia and then shaved my leg around the wound. He took out a few more small pieces of shrapnel from my leg, gave me a shot of penicillin, put medication on the wound, and then he wrapped it with gauze. I had to lay on the cot the remainder of the day, and the doctor would come by periodically, remove the gauze, inspect the wound, and then apply additional ointments before he dressed the wound. I stayed at the field hospital overnight, and the doctor examined the wound again the following morning. He was not pleased with the way the wound looked, and he told me that he didn’t have the facilities to properly treat the wound because it had gotten infected so badly. He tagged me and told me he was sending me to the hospital in Qui Nhon. 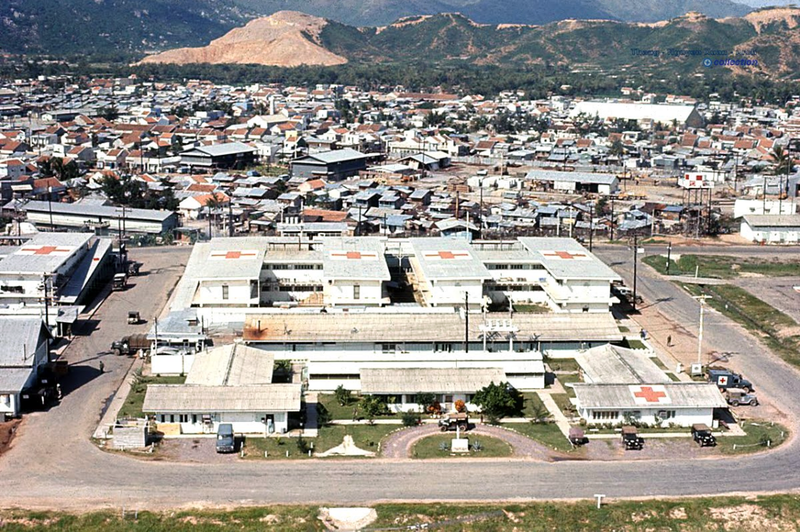 I boarded a medevac helicopter on Monday, July 31 and was transported to the 67th Evacuation Hospital in Qui Nhon. Upon arrival at the hospital complex, I was directed to an area close to the entrance door where a doctor and nurse had set up a triage station. About five or six other wounded soldiers were also going through the triage process, a couple of which were so badly wounded they had to be taken to the station on a stretcher and were receiving blood transfusions. Since I could stand and walk, I assumed I would have to wait around while they processed the badly wounded soldiers. To my huge surprise, I was the first soldier taken into the hospital ward. I made a comment to the effect that they should take the more seriously wounded first, but the nurse told me that they were much more qualified to make those decisions. One of the nurses directed me to an empty bed and told me to take off my uniform and boots, and to get dressed in one of the hospital gowns. The bed was extremely comfortable, probably because that was the first time I had laid down on a mattress since May when I was in Oakland waiting for my flight to Vietnam. A doctor came by and examined the infected wound on my right leg and told me the infection was so severe that, if I had waited another couple of days before seeing a doctor, I would have lost the leg! I was shocked, I had no idea that the wound had gotten that serious. Then, I became very angry with the field medic who had shown little to no concern regarding my complaints regarding the pain I was having with the wound. The doctor then put a pillow under my leg so it would be raised above the level of my heart, gave me a penicillin shot, placed some ointment on the wound, and then placed a medicated, moist pad over the wound. The doctor told me that I was to be on 100 percent bed rest, and the only reasons I was allowed to get out of bed was to go to the bathroom. The doctor scared me so much that I completely and totally adhered to his instructions. On the third day I was in the hospital I requested and was granted permission to take a shower, and I got on a schedule of taking a shower every two or three days. As I was drying off after my second shower, I noticed some skin discoloration on some areas of my face, stomach and arms, but I didn’t think too much about it at that time. After my third shower, the skin discoloration was even more severe and I was getting very concerned that, while walking through the foliage in the jungle and being exposed to the human and animal excrement in wet rice patties, I may have contracted some skin disease. Then, after looking at the skin a little closer, I noticed that not only did I not have a skin disease, I also didn’t have that nice tan I thought I had gotten because I had been in the hot sun for so long. Instead, I discovered that I was covered with a layer of filth and my showers were simply washing off the filth! My stay in the hospital was very boring because I was not allowed to get out of my bed except to go to the bathroom. And, a nurse came by about every three or four hours to give me a shot, place ointment on the wound, and replace the medicated pad. I wrote a lot of letters and got to know Martin Terrill, the guy in the bed next to me, pretty well because that was just about all I was allowed to do. I tried watching the television set that was in the hospital ward, but it was so far away from me that I couldn’t see what was on, and I could barely hear the sound. However, we did have some excitement because of an alert on the evening of August 6. They turned one row of lights off in our bay, and one of the male orderlies brought his M-14 and some ammo so he could protect us in case of any danger. My thought was the biggest danger we would have would be if he had to fire his M-14. After I was in the hospital for about nine or ten days, one of the nurses who didn’t routinely work in my ward told me get a rag and pan of water so I could help clean the ward. I was happy to do that because I was finally able to get out of bed. However, the doctor came by about ten minutes later and told me to get back in bed, and he told the nurse of my restriction to bed rest. To make matters even worse, I didn’t get any of my mail for two weeks. My mail finally came on August 12 and I received 31 letters. I spent more than an hour reading them, and then spent some time to answer them. On the evening of August 13 I was allowed to get out of bed and go watch the movie “Georgy Girl,” starring James Mason, Alan Bates and Lynn Redgrave, that was being played in an area just outside my hospital ward. The doctor came by the next morning, August 14, and told me that I was being released from the hospital and being returned to my unit. I was confused and concerned because I had spent 15 days of 100 percent bed rest and now I was expected to report back to my unit before I was even given the opportunity to regain my ability to stand and to walk. But, since I was released, I changed back into my old fatigues and boots and was put on a twin engine prop plane and flown to An Khê and then to LZ English. The winds must have been very high that day because the plane was moving around a lot, both bouncing up and down and swerving from side to side violently. While at LZ English I had to draw a different M-16 than I had before I went to the hospital, but I wasn’t allowed to zero the sights. I also had to check out a new harness, canteens, grenades, claymore, trip flares, entrenching tool and ammo for my M-16. I was then loaded on a chopper and assaulted to join my platoon at coordinates BS754028, which was about four klicks southwest of LZ Laramie. I really struggled for the first three or four days until I could regain enough strength and stamina to stay up with the other guys in the platoon. As a side note, to this day, 47 years later, I still have discoloration and recessed spots in my leg, and it is still sore to the touch. LZ Geronimo — for maps showing this LZ and vicinity, see Bồng Sơn, the An Lão Valley, and Tam Quan, and for the events of July 4, see July 3-4 in the "Odyssey" series. LZ English — see the following maps: Bồng Sơn, the An Lão Valley, and Tam Quan, Bồng Sơn, LZ English, LZ Two Bits. LZ Two Bits — for this LZ, see: Bồng Sơn, the An Lão Valley, and Tam Quan, Bồng Sơn, LZ English, LZ Two Bits. Qui Nhon — for the location of the hospital at Qui Nhon, see the map, Qui Nhơn. An Khê — see, An Khê and Vicinity. LZ Laramie — see the map, Base Map for LZ Sandra (August 1-19, 1967) in the Odyssey series.